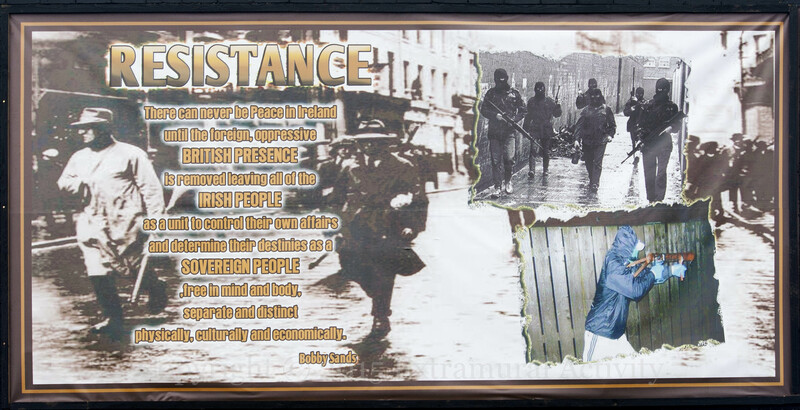 “Friends and comrades” – IRA volunteers Brendan Hughes (“The Dark”) and Bobby Sands were leaders of the 1980 and 1981 hunger strikes, respectively. Hughes survived when the first strike was called off after 53 days; Sands died in the ’81 strike after 66 days of fasting. “IRPWA” is the Irish Republican Prisoners’ Welfare Association (Fb | tw); Saoradh (web | tw) is a hard-line left-wing republican party. The mural to the left shows Palestinian double-amputee Saber Al-Ashkar, protesting as part of the Great March Of Return. Robert Ballagh’s 1916 Proclamation was first painted as a mural by Mo Chara Kelly and Risteard Ó Mhurchú in 1991 for the 75th anniversary of the Easter Rising (see Cáisc 1916 which also contains the Ballagh piece). That version stood for ten years on the Whiterock Road. It has reproduced again in Ard An Lao above the hunger strikers, after the removal of several plaques (see All Our Dead). “With special thanks to Hugo Óg Wilkinson”. | Ardoyne | St James), an éirígí mural featuring Patrick Pearse, and a call for the release of the Craigavon Two (previously featured). “In memory of the all the unsung heroes off [sic] this area who’s [sic] hardship, sacrifice and support during this struggle for Irish freedom will never be forgotten by the Belfast Brigade óglaigh na h-éireann.” The plaque depicts the work of print-makers (“Smash H-Block Armagh”), marchers carrying portraits of hunger strikers (“Mid Falls supports the women of Armagh”), bin-lid rattlers, and muralists (the mural shown is Free Ireland, which was at the bottom of Beechmount Avenue). “Praise youth and it will respond – the laughter of our children – the joy of our hearts.” A young Bobby Sands is shown in the front right, part of the Stella Maris soccer squad for 1967; he would later “respond” by becoming an IRA volunteer and hunger striker. The plaque to the hunger strikers was originally on the left of the previous ‘1798’ mural, and the plaque to the deceased from the “greater Newington area” was embedded in it – see M03672.